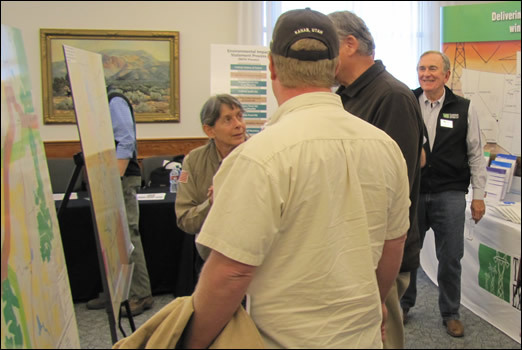 Feb. 17, 2011 - As the public scoping open houses continue along the proposed transmission route, dozens of people are coming to learn about the TWE Project. They also are sharing comments for BLM and Western Area Power Administration to consider as they prepare an Environmental Impact Statement for the project. Here are some excerpts from local media coverage of these open house events. "We need all the energy we can get, especially as our population continues to grow. If we are also going to be mandated to provide increasing amounts of green power, as we have been, then we need to support the technology to deliver it." "It is part of who we are as Moffat County - energy is a big part of who we are." "It is going to be a collaborative process." "There is certainly a need for new transmission in the West." "Rights-of-way are not established until after the environmental documentation is completed. But, every effort will be made to work with land users to sustain compatible uses." "The preferred route for the line is through isolated parts of Moffat County, across northeastern Utah and into the southern part of the Wasatch Front in Utah, then on to Las Vegas. It appears to be a shorter, more direct route. Federal agencies should stick with the preferred route and eliminate the alternative through this region." BLM project manager Sharon Knowlton explains the proposed and alternate routes to interested attendees. The BLM and Western are accepting comments during the current 90-day public scoping period, which ends on April 4. Comments of support - whether related to using public lands for public purposes, encouraging renewable energy use, creating jobs, spurring economic development, strengthening the electric grid, balancing resources, or other matters - can be sent via via e-mail to TransWest_WYMail@blm.gov. A calendar of the remaining public scoping open houses is available on the TransWest Express site.